There is nothing wrong with the hiking of President Edgar Lungu’s salary because it has come after unionized civil servants concluded their collective bargaining with Government, says the Zambia Congress of Trade Union (ZCTU). And the Patriotic Front (PF) says it was ignorance for Ms Sera Longwe and her publicists to allege theft and imply that President Edgar Lungu was practicing theft on account of his salary increment. Yesterday, Non-Governmental Organization Coordinating Council (NGOCC) charged that the move by President Lungu to increase his salary while people are languishing in absolute poverty is criminal and a sign that the Patriotic Front leadership has no heart for the people of Zambia. 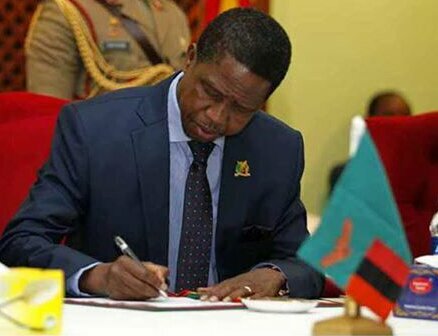 But ZCTU Secretary general Cosmas Mukuka said President Lungu’s salary increment was justified and it was in line with the labour movement’s role of ensuring that the wealth of people including the Head of State was improved. He said just like any other public servant, this was not the first time a President’s salary was being adjusted. Mr Mukuka said the adjustment had in fact come after unionized civil servants concluded their collective bargaining with Government. Mr Mukuka, who opposed the position of the Judiciary and Allied Workers Union of Zambia (JAWUZ) on President Lungu’s salary increment, said any salary increment must be supported by the labour movement because one of its roles was advocating for wealth. On Wednesday, JAWUZ president Davy Chiyobe was quoted saying it was immoral for the president and his cabinet to get huge salary increment. But Mr Mukuka said it was wrong for Mr Chiyobe to criticize President Lungu’s salary hike after the collective bargaining for 2016 were concluded. Mr Mukuka has warned affiliates against politicizing President Lungu’s salary increment but use it as a stepping stone for the 2017 collective bargaining. He said in October this year the labour movement would start negotiating for improved conditions of service for 2017 hence the need to use President Lungu’s increment as a basis for negotiations. He urged Mr Chiyobe and other trade union leaders to use President Lungu’s salary hike as a stepping stone for bargaining for the 2017 negotiations. “It is supposed to be used as a benchmark for discussing new salary and conditions of service for the next bargaining process which will start in October,” Mr Mukuka said. He warned union leaders to desist from publicly commenting on certain issues to avoid being accused of being partial. Mr Mukuka said the national unions should be very sensitive because 2016 was an election year and they would be seen to be positioning themselves for possible adoptions. “People will think they are politically motivated if they continue commenting carelessly,” he said. Mr Mukuka said he did not see anything wrong with the increment of President Lungu’s salary hike because it provides the congress a benchmark for new salary and conditions of service for 2017.